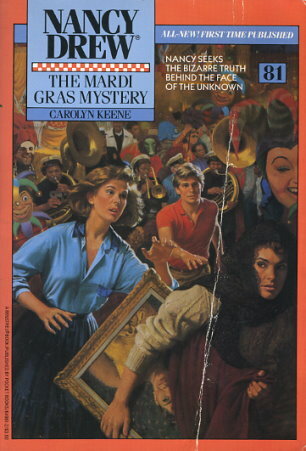 NANCY GOES ON A MARDI GRAS ADVENTURE AND FINDS HERSELF IN THE MIDDLE OF A MILLION-DOLLAR SCAM! When Brian Seaton invites Nancy and her friends to join the fun in New Orleans, they plan a glorious week of parades and parties in America's most romantic city. But Nancy gets more than she bargained for: a taste of Mardi Gras mischief and madness. Brian's father is determined to possess a haunting portrait of his late wife, Danielle. Then the painting is stolen and held for ransom -- and Mr. Seaton is accused of the crime. When Nancy spots a woman in the French Quarter who looks startlingly like Danielle, she follows her, hoping to clear Mr. Seaton's name. The chase leads to an ominous warning, a shocking revelation, and the tragic secret behind Danielle's life -- and death.